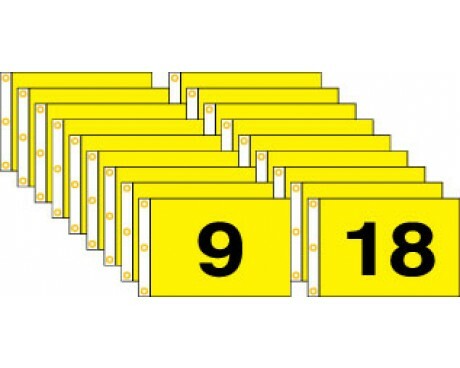 Golf Flag Set 1-18 (Black on Yellow) - 14x20"
Golf Flag Set 1-18 (Red & White) - 14x20"
Flag sets serve a variety of purposes. 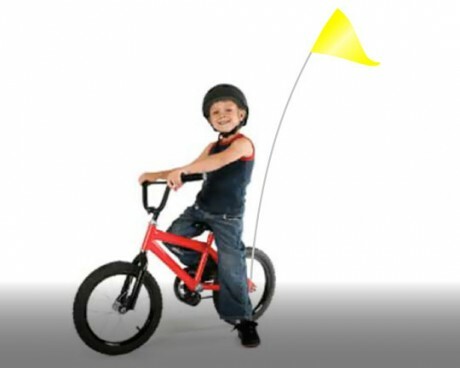 Golf flag sets are used to mark courses, state flag sets can be used for educational purposes in classrooms, American flag sets can be used to decorate your home or business - the list goes on and on! 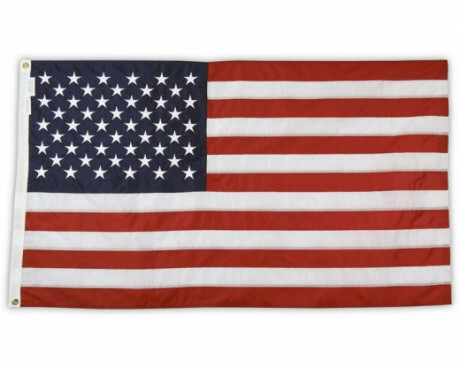 If you're looking for affordably priced flag collections, you've come to the right place! 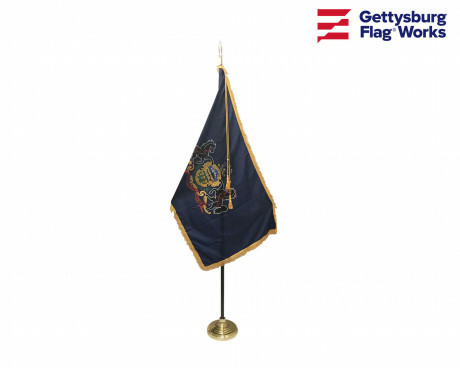 At Gettysburg Flag Works, we carry a large variety of flag sets including US flag sets, street flag sets, indoor flag sets and more! 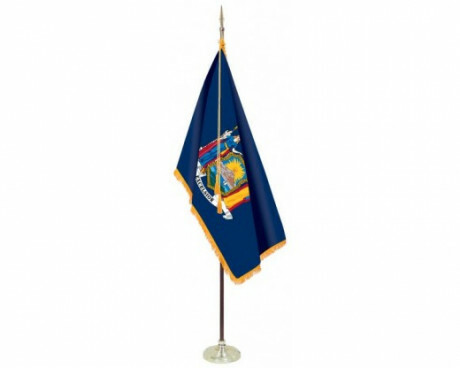 Presentation flag pole sets are the decorative display flags commonly used in offices, churches, meeting halls, and even displayed in multiples behind your state senator when he/she gives a speech. These are the highest quality American, state, military, religious and other indoor flags with fringe. 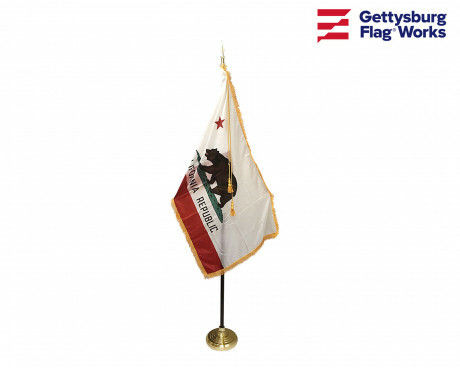 These flags are generally mounted to an oak or aluminum gold pole and rest in a heavy flag base. 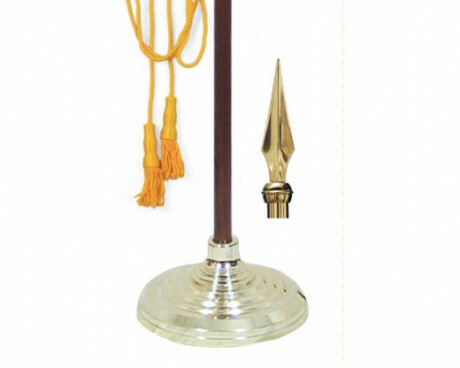 Each flag set includes a finial, and the traditional cord and tassel decoration. 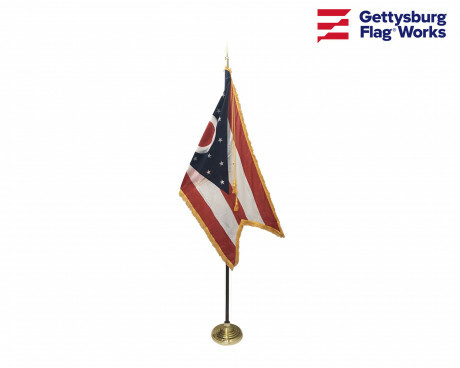 Presentation flag pole sets are also available without flags, to allow you to choose your own flag, or mount a custom flag to your flag pole set. 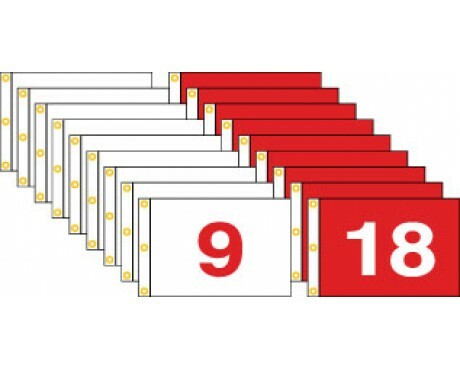 Indoor Display Flag Set: A presentation flag set would add a beautiful touch to any office or public room. These sets come in 7', 8' or 9' tall poles. American flag sets, state sets, & religious sets come complete and ready to go. 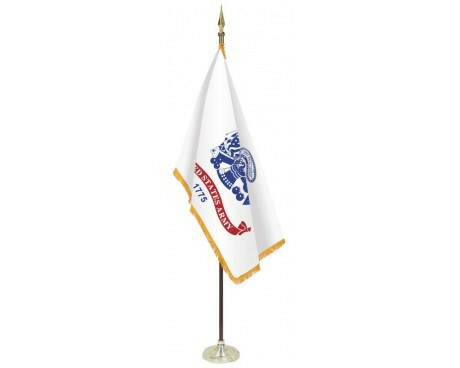 We can add any military flag or service flag to a set or piece one together. You can choose from many finials in both gold and chrome finishes. Floor stands come in many different designs to suit your space. Parade Flag Sets: Complete flag sets ready to assemble and start marching. 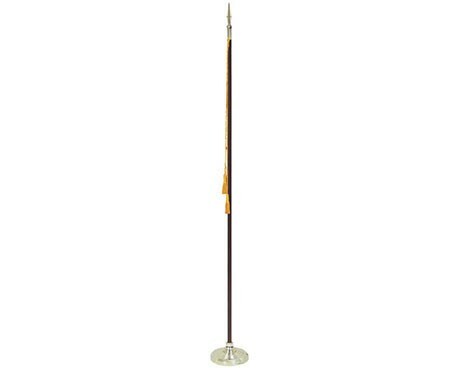 Quality wooden or aluminum poles, eagle or other ornament, decorative tassels and a high quality flag. 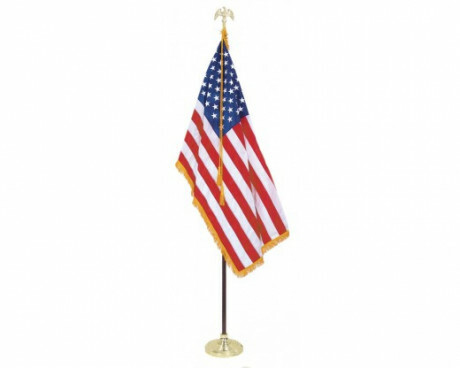 Flag pole sets for the American flag, military flags, religious flags or without a flag so that you can choose your own. Customized Indoor Flag Sets: Did you know that we can make a stunning presentation flag for display on your indoor flag set? Your logo, motto or any other design can be sewn, embroidered or printed on a new custom flag. 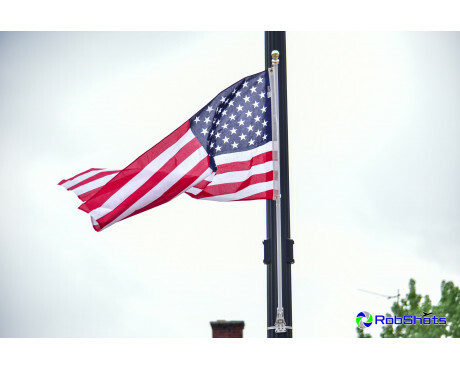 Street Pole Flag Sets: Be ready for upcoming outdoor festivals, 4th of July, parades and BBQ's, by decorating your town with American flags! 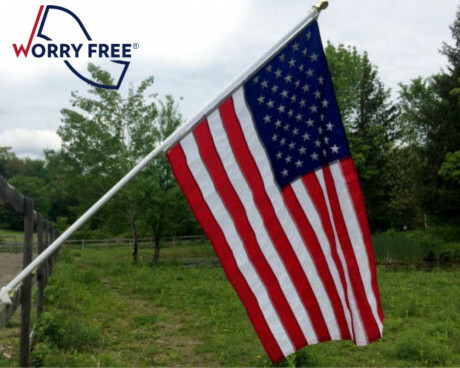 Complete flag pole set comes with a Worry-Free spinning pole, bracket, American-made American flag & a strap for mounting! Nautical Flag Sets: Nautical flags are great for your yacht, sailboat or dock, but we've recently added a string of pennants for decoration, indoor or out. Great for parties or coastal businesses! 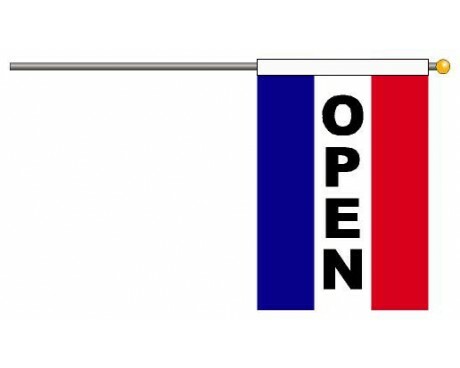 Open Flag Sets: An open flag pole set comes complete with a pole and bracket for mounting to your building. 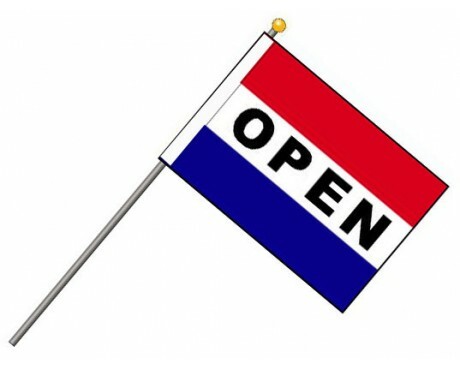 Open flags are well-known as a great way to bring in business. 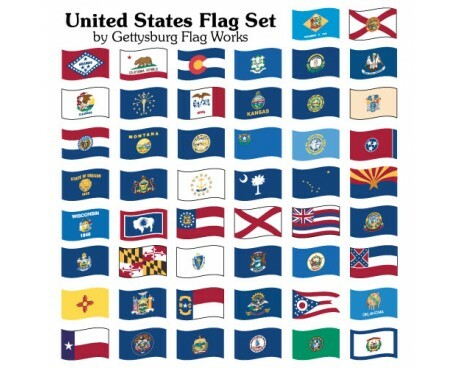 US State Flag Sets: These flag sets showcase each of the 50 American state flags. Available in indoor, outdoor and stick flag varieties. Military Flag Sets: Our military flag sets are a great way to show your military pride in an upcoming parade or with an indoor flag display. United Nations Flag Sets: A complete flag collection of each member of the United Nations organization. 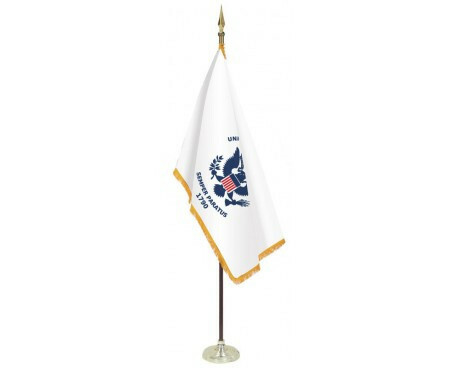 Available in outdoor or indoor flag sets. OAS Flag Set: A 35-part flag collection of each member of the Organization of American States. Available in outdoor or indoor flags. Shop Our Flag Collections Today! 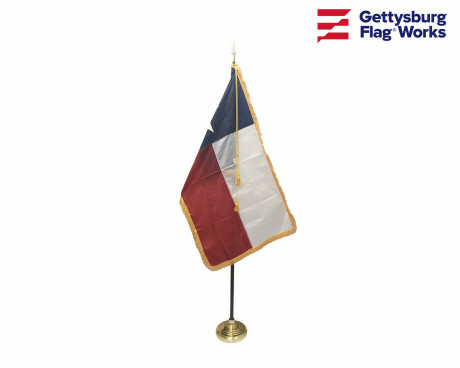 No matter what type of flag set you're looking for, we've got you covered! 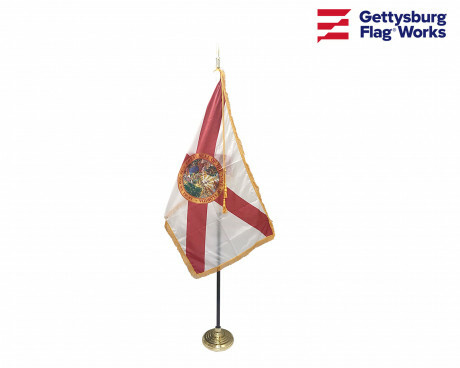 Browse our selection for the flag set to meet your needs. Can't find what you're searching for? Give us a call at 1-800-697-3524 or contact us online and we'd be happy to assist you!